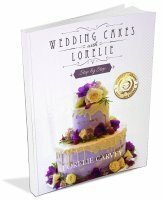 Design Your Own Wedding Cake With Cake Decorating And Designs That You Can Do! 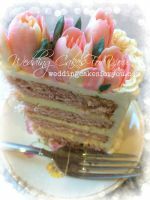 Design your own wedding cake? Yes! you can do it! You will find many design ideas and examples of homemade designs right here on this web site. 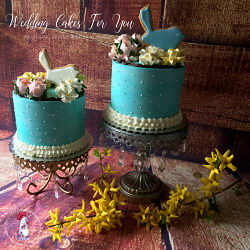 How about a wedding dress cake, or a whimsical creation with a unique topper. 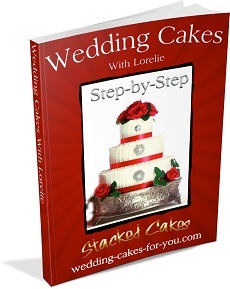 Even if you are not planning on making your own wedding cake you can still design it. 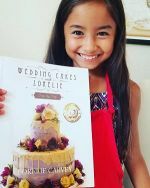 The large fondant flower and draping are hand done and very unique. I have never seen this type of sugar flower before. 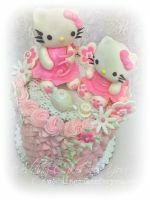 By playing around with fondant and imagining it is fabric in your hands you can create flowers and shapes of all kinds. Cake Stacker's were used for this four tiered beauty. 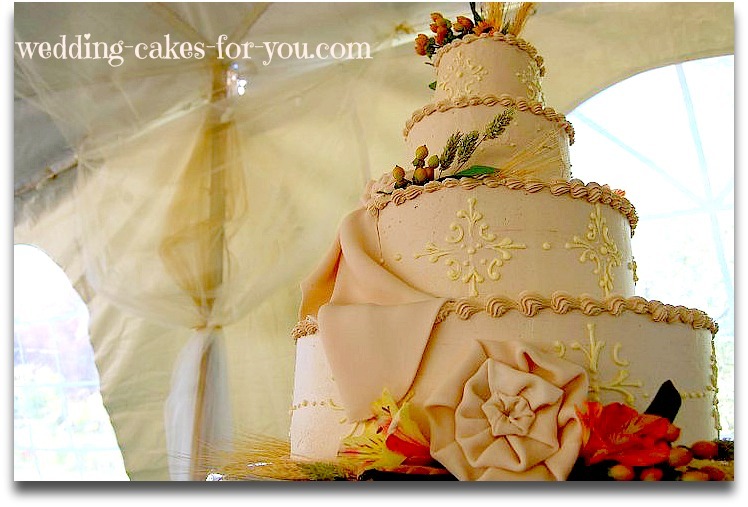 Look for details in the fabric of your gown and consider incorporating them into the design of your cake. Do you have a hobby or activity that you would like to express your passion for? Make a list of possibilities no matter how crazy they seem. Here is an example of what the possibilities are. 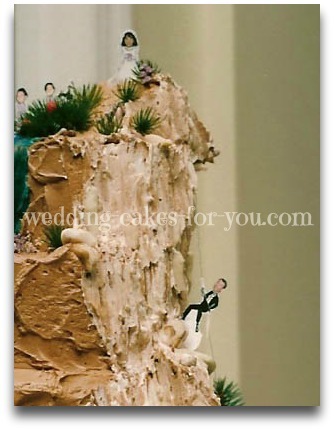 A bride and groom mountain climbing couple asked me to design a cake that looked like a mountain with a tiny bride and groom and the entire wedding party climbing it. 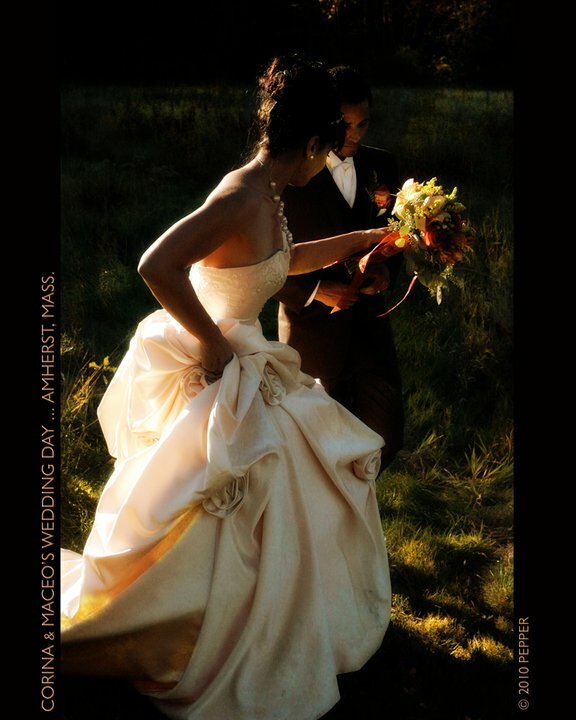 Think about the setting at which the ceremony will take place. By the ocean? 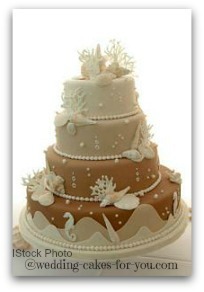 You might want to design your own wedding cake around a beach or a tropical theme. Link to more ideas for beach themed cakes. 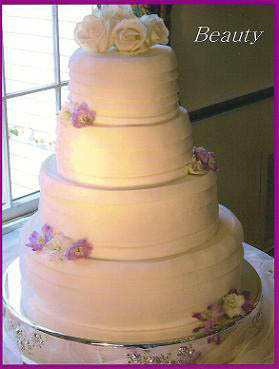 The cake below is another great example of a design inspired by the brides gown. The dress was made of horizontal strips of satin fabric. 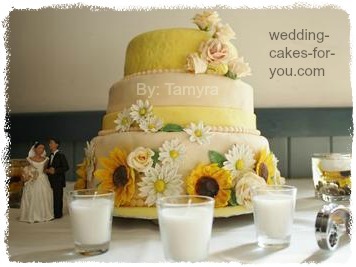 It is a made using fondant a.k.a. sugar paste, and is the perfect substitute for a satin fabric look. 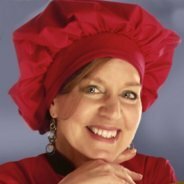 Start clipping out pictures from magazines of designs that you like. The don't have to be a cake pictures, they can be literally anything. Do look at as many pictures as possible and clip or print those for reference.